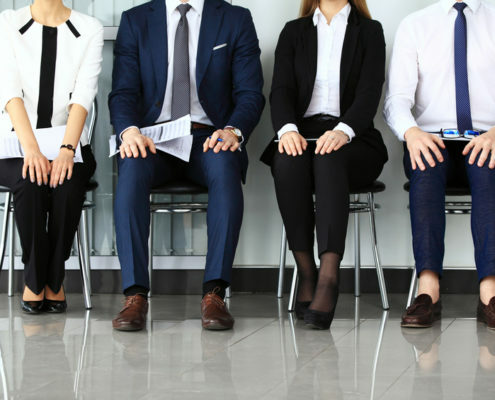 Looking to reduce the guesswork in your hiring decisions? Finding the best employees for your open positions can often be challenging. Excessive turnover costs your organization time, money and lost opportunities. But with in-depth personality assessment testing, you can quickly obtain objective information on a candidate’s strengths and weaknesses, and expert guidance on how best to manage that individual in your organization. At Lighthouse Consulting Services, LLC, we recognize that finding employees with the right “fit” for your organization is critical. Understanding a new hire or staff thought processes can help in getting your maximum ROI (Return on Investment). Excessive turnover costs your organization time, money and lost opportunities. Not only that, but hiring someone with the wrong “fit” reduces your organization’s productivity and negatively impacts your bottom line. As with any business decision, having the right information is essential. 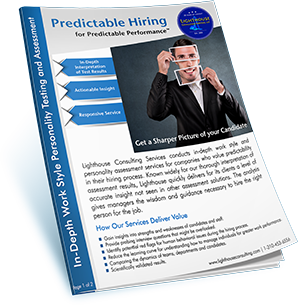 And now you can have that insight into how potential hires will fit into your organization with Lighthouse’s in-depth personality assessments. These tests can quickly provide you with objective information on a candidate’s strengths and weaknesses, as well as expert guidance on how best to manage that individual in your organization. Organizations large and small have benefited from in-depth personality assessments as part of the pre-employment screening process. With the test administered securely over the internet, you can get in-depth results on your candidates within 48 hours. Learn how to get the maximum ROI from your employees. Whether you need to hire for a critical position, reduce employee turnover or improve team effectiveness, in-depth work style and personality assessment testing can save your organization time and money, provide the insight you need to make educated staffing decisions and increase employee productivity.